You arrive on the Playa in Black Rock City and see all the fancy art cars cruising the dust, they look amazing. Immediately you are pulled toward the awe inspiring piece that looks like something out of your imagination. How do they dream these up let alone make them? What is the process like? Who are these people? We are at that place. 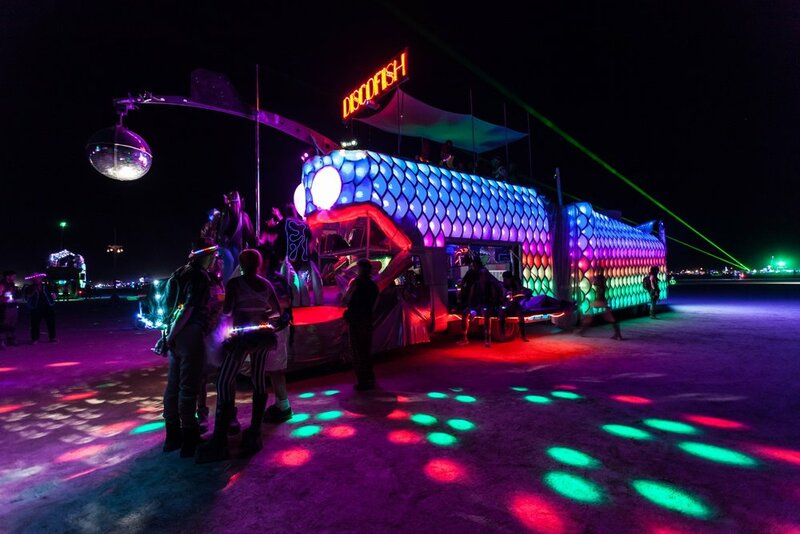 We are putting our last art car, the DiscoFish, behind us and moving forward with a new vision. We are dreamers, makers, and creatives -- with 7 years of art car experience. 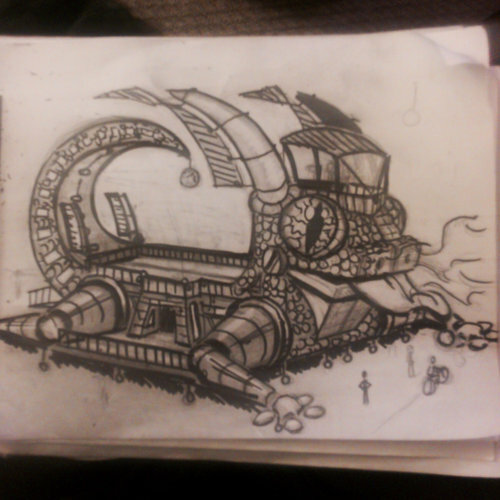 For any virgin burners or anyone that hasn't been part of the art car process, here is how we landed on the vision for our new art car, TechnoGecko. Time to Burn: 9 months. The DiscoFish crew got together and discussed endlessly what we wanted to see, what the design had to have, what would be cool, what would actually be possible, and what would inspire others. Realistically, what factors will be constraining us on the play? Can they be overcome? Needs to fit through the 'streets' to get from camp to playa. Needs to get from build side to playa via highways. Safety of onlookers and burner aboard. Being able to keep people off things that they shouldn't be on and easy to get them in and out of the art car. Accounting for the number of people coming onto the art car and make sure the body can withstand the weight load. With the experience from DiscoFish behind us and several decades of burns between the crew, those concerns were anything but concerning. But, we wanted to make something more grand. 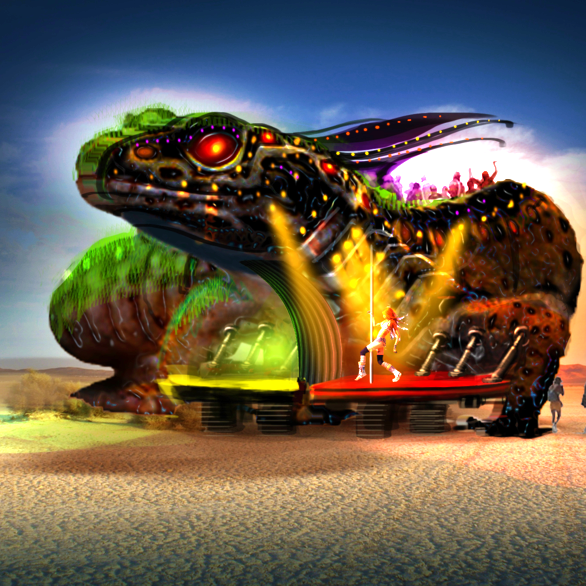 We thought -- what would an audacious art car look like? Some of are ideas during that think tank session were inspiring. In the end, we landed on a massive multi-vehicle art car. It's the easiest way to make things, well, bigger! The modular unit solved the width constraint of the streets on the playa and on the road to Black Rock City, and will allow us to develop it in phases over a few years yet still be functional at each burn. Then we dove into the details. The next area was the name with ideas being suggested from all across the map. But, in keeping with tradition, we decided we wanted to keep the animal-music theme going. 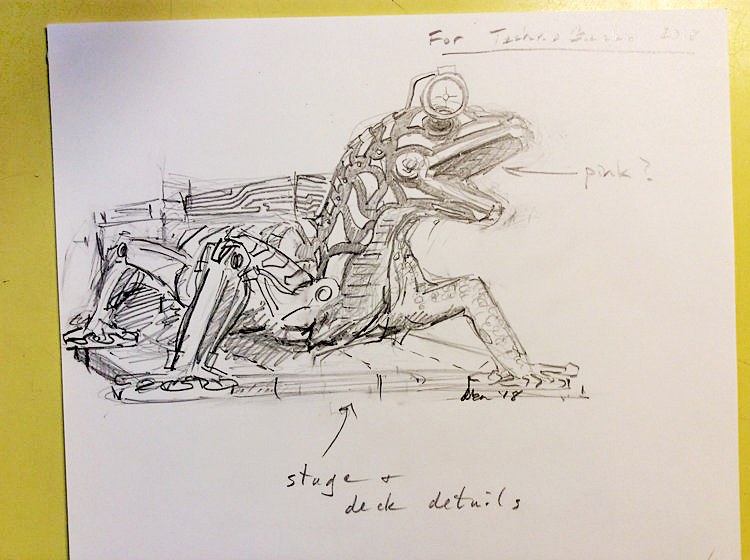 TechnoGecko was born. This literally took a solid month to land on. 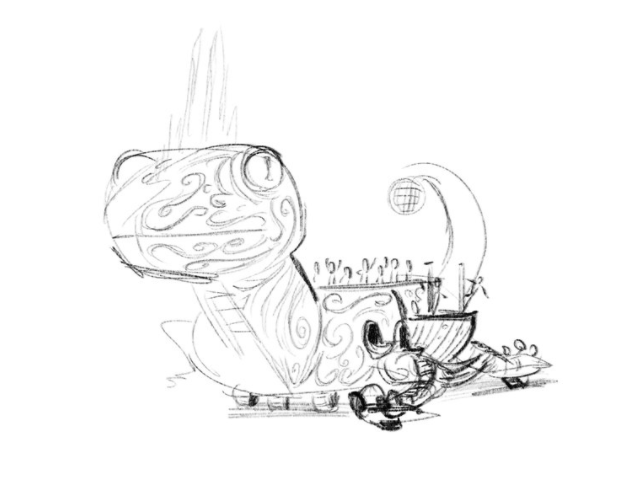 With that, the crew creatives jumped in and started drawing ideas to give it legs, literally and figuratively. Below are a few first passes. It was during this time and in conjunction with the 2018 theme of I-Robot that the half and half theme was born. Half should have a nature feeling and the other half a more cyborg, metallic feeling. 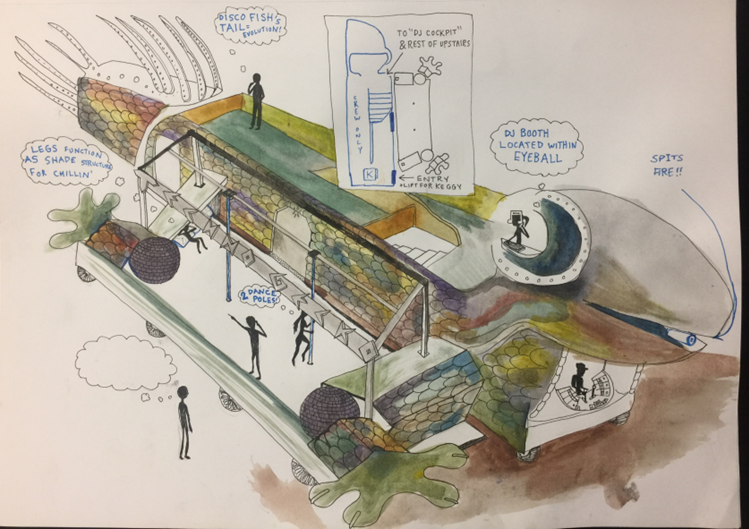 Our engineers started working to develop ways to make these drawings a reality. You can't Amazon these pieces, they don't have YouTube DIYs or places to get out-of-the-box pieces like this. It's custom from the ground-up. As the math started to play out, the vehicle started to develop a new face. With a concept, name, and design we embarked on timing. It would be a beastly project that would need to occur in phases. Below is what we hope to have done each year. Then the fun part -- the build. Time to make things happen. Looking to help us? Local to Sunnyvale and skills you can contribute? Want to donate to the art project? We are always looking for more resources and volunteers!